Bindo makes things easy for employees and business owners with its well-designed app, and the company offers a 14-day trial to give new customers a chance to try out this POS system. Bindo is a cloud-based iPad POS system for retail and restaurant businesses, but this wasn’t always the case. To begin with, Bindo had the aim of indexing local inventory online, and creating a ’hyperlocal’ marketplace to bolster the online shopping side of local stores. Bindo later evolved into a full-fledged POS system, but the idea of helping small businesses compete with larger retailers remained in the form of the Bindo Marketplace which makes it possible for businesses to quickly connect with potential local buyers. So let’s take a closer look at Bindo to see how this POS system stacks up against the competition. Getting started with Bindo POS is easy as the company offers a free 14-day trial for all new customers which doesn’t require you to provide any credit card information. After that, things get a little more complicated as Bindo POS doesn’t offer traditional plans. Instead, the company has plans that are completely tailored to the needs and size of your business. These plans can also be extended to be used on more than one register, but you will have to pay an additional fee. The company offers three basic plans: Essentials, Pro and Enterprise, though you will have to contact Bindo directly for a quote. In addition to the cost of the plan you choose, you will also be charged a percentage ranging from 2.5% to 3.5% plus $0.10 for each credit card sale you make with the company’s POS system. The initial setup requires you to download the Bindo POS Point of Sale app from the App Store and create your store within the app. In terms of hardware, the company’s POS system works on the iPad 3, iPhone 5 and iPod Touch 5th-generation or newer. You have the option to use a device you already own and just purchase a barcode scanner, printer. and cash drawer a la carte from Bindo, or you could go with the company’s own Bindo Hardware Bundle which includes a Windfall iPad Stand, APG Cash Drawer, Socket Mobile Barcode Scanner, iMag Pro Card Reader and a Star Micronics Receipt Printer. Once you have the hardware you want to use picked out, it’s just a matter of getting it set up. Your receipt printer should be connected via CAT 5 Ethernet cable and plugged in. From there, you need to go to Bindo Settings, find the Hardware option, select Receipt Printer, tap on the three dots and select Connect. The cash drawer is even easier to set up and can be installed by plugging the larger end of its cable into the printer, and the smaller end into the drawer. From the register screen, you can easily see if your devices are properly connected by looking at the indicator icons in the lower left corner. If an icon is blue, that means it’s connected, but if it’s gray, the device is not connected. Bindo POS includes a wealth of features to make things easier for business owners, but the app’s user-friendly design will probably be one of the first things that you notice. The app’s menus can be easily navigated and all of the information you’ll need to take payments and manage your store can be accessed via the Bindo dashboard on the left side of the screen. Setting up the app is a fairly straightforward process. The company will also import any previous documents from your business for free into Bindo POS during the first two weeks of service, though after that adding any other bulk information will cost you $250 for each upload, so make sure to add everything you’ll need after you first sign up. Regardless of which plan you end up choosing, Bindo offers availability for a large stock of items. The company’s app is capable of handling thousands of products and this provides business owners with a very substantial platform that makes online purchases easy for customers. 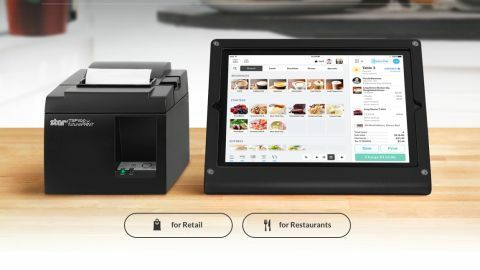 In addition to retail businesses, Bindo also offers POS systems for restaurants that include table management, a seamless reservation and waitlist system, an intelligent menu system that offers near-instant item selection at checkout, large pictures to show your customers, and a pure text option for even faster checkout. You can even track your ingredients with Bindo POS so you know exactly how much of each ingredient you have, and how many dishes you can make and sell. Online orders are also accepted. In terms of staff features, Bindo POS allows you to set different permissions for employees and create custom profiles for each staff member. You can also keep track of how long each employee has been working to help with your payroll. From within the Bindo POS app, you can create common item shortcuts to quickly access the most popular items. This allows you to make sales more quickly and keeps employees from getting frustrated by being confronted with too many menu items. These are just some of the features that Bindo POS brings to the table, but overall the company’s POS system is fast, lightweight, and designed to help simplify the sales process for business owners and employees alike. While Bindo POS offers a great deal of features in an easy to use package, it might not be the right POS system for your business, so here are some alternatives worth considering. If your business is primarily run on Windows, then you might want to consider QuickBooks POS as you can use its software on all editions of Windows 10 as well as on Windows 8.1 (Update 1) and Windows 7 SP1. You can also easily export your POS data to Microsoft Word or Excel. If you already use Intuit’s financial software, then you’ll be right at home with QuickBooks POS. If you run a restaurant and want a dedicated POS system focused on food service, then Toast POS may be the right choice for you. The company’s well-designed hardware has been engineered to withstand the rigors of any restaurant environment, and it runs on Android which should make the overall cost a bit cheaper. Bindo makes the process of setting up and using a POS system incredibly easy, even for those new to the world of POS. Its app has a clean and simple user interface that will likely make training up new employees much easier than with other POS systems. While Bindo POS doesn’t offer traditional payment tiers, it is a nice touch that the company is willing to create tailor-made plans for each customer, and the free 14-day trial gives you a chance to see if this POS system is right for your business.